I’m always looking for ways to manage my mental health on a day-to-day basis, whether it’s a book, a bubble bath or breathing exercises! Self-care is a term that’s thrown about a lot at the moment but don’t disregard it – it’s so important to take time out for yourself. So when I heard about an app designed to help you self-manage common mental health conditions, I knew I had to give it a try! 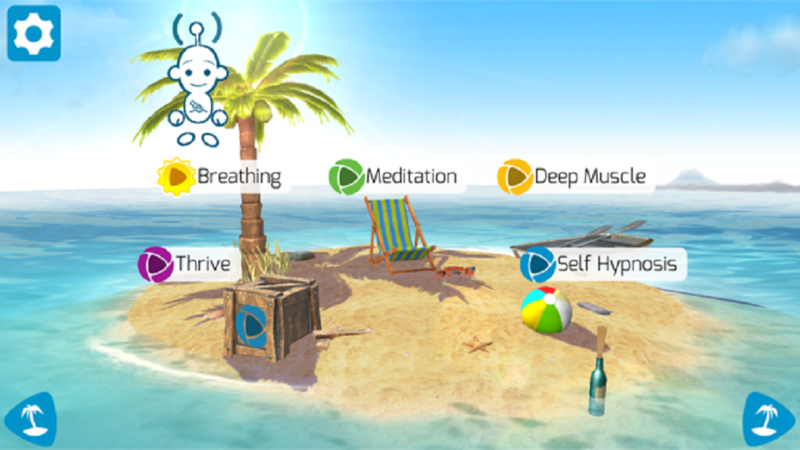 Thrive: Feel Stress Free is an app which can detect, prevent and help manage common mental health conditions, using clinically proven techniques. It uses elements of Cognitive Behavioural Therapy (known as CBT) to help you track your daily thoughts and moods so it can help spot signs of depression and anxiety. It also gives you the tools to manage these conditions, through therapeutic techniques and games. I’ve suffered from anxiety and depression on and off since my teenage years, but most recently my anxiety affected my life in a huge way. After getting some great treatment I’ve tried hard to keep up the care of my mental wellbeing and Thrive seems to be the answer! I didn’t think it would be so easy to use. Thrive guides you though! You begin each session with the daily thought trainer, selecting your mood on the meter and answering a series of questions about how you feel and what might be causing it. What I love about this feature is how it always leads you to a positive outcome, whether your mood is good or bad. You can also add your own options to the thought bubbles, making the experience personal. I’ve had some health concerns recently, so creating and selecting things that related specifically to my health helped me to focus positive thoughts. I saw an instant link to my previous course of CBT and it was great to reinforce that knowledge and practice, turning negative thoughts into positive ones. Instead of fearing the worst I am now being encouraged to realise ‘things don’t always turn out badly’ or even ‘if the worst were to happen I can still cope’. Thrive suggests tasks for you to complete based on the questionnaire, whether it’s exercises within the app or a physical activity like going for a walk. I love how intelligent this app is! Within just a few days it had set me up with activities related to ‘coping with health problems’ and it gave me daily exercises and tasks to specifically combat the negative thoughts surrounding my health concerns. You can follow the suggested daily activities or pick and choose your own. This is where Thrive is worth its money and more! I don’t know what I’d do without the range of therapeutic exercises Thrive offers. The first night I tried the breathing exercise was a dream. I slept better than I’d slept in months and felt full of energy the next day! I now try to alternate between the breathing, deep muscle and self suggestion exercises before bed each night. I have really noticed the difference in my sleep quality! There’s only one thing Thrive can’t do for you – making you complete this app each day! You have to be committed to daily self-care to get the best out of it, but even that can be supported with reminder notifications to complete your daily goals. We all need to prioritise self-care and Thrive gives you the tools to do that – daily prevention, detection and treatment, followed up by links and pointers to further support should you need it. Not everyone is comfortable speaking up about their mental health, so having the app to gently nudge you in the right direction is perfect. Mental health is different for everyone and Thrive understands that. It’s your app. You can do things at your pace and make it specific to you. It doesn’t judge or force, it guides and encourages. Having therapy in your pocket could be the support some of us need to get through the day and the team behind Thrive have made accessing therapeutic techniques as simple as it should be in the 21st Century! For as little as £3.99 a month you can have Thrive’s therapy at your fingertips… (that’s about the price of a fancy iced coffee!) But try it out for yourself first with a FREE trial for Rochelle Balboa readers. Simply download the app and enter the code JUNE18SUMMERFSF when you sign up.